There were an average of more than 8,250 job openings reported by employers in Southwest Minnesota over last year’s Job Vacancy Surveys, easily the highest number ever reported. Opportunities abound in industries like health care and social assistance, retail trade, manufacturing, and accommodation and food services. For the first time, there was less than one job seeker for every vacancy in the region, creating a tight labor market for employers. Despite the record number of openings, not every job seeker wants to work for someone else. Instead, many people dream of being their own boss – and self-employment often becomes more attractive in a strong economy. With so many sectors of the economy expanding, a wide variety of people have decided to strike out on their own or supplement their regular job with a side hustle. However, self-employment activity is not captured in DEED’s Job Vacancy Survey or DEED’s Quarterly Census of Employment & Wages; it is only tracked through tax returns filed with the Internal Revenue Service. The U.S. Census Bureau uses data from the IRS to provide statistics on the number of nonemployers in every county, with 2016 data released last month. 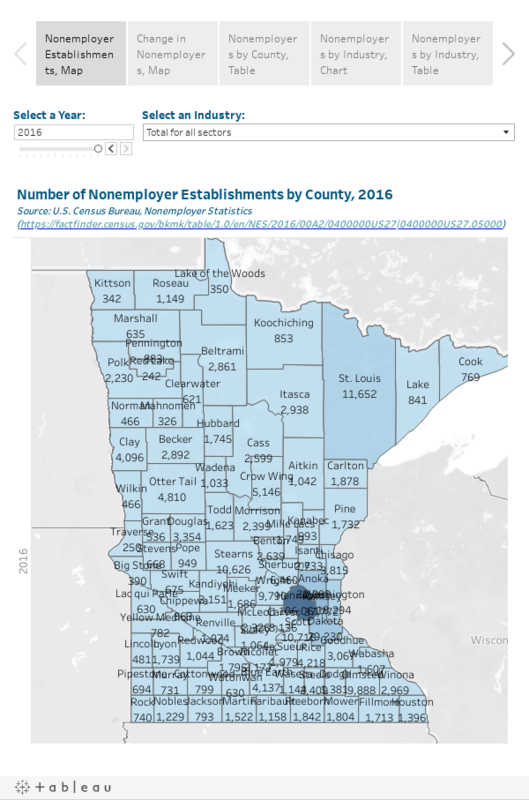 According to the nonemployer statistics – defined as businesses that have no paid employees and are subject to federal income tax – there were just under 27,200 self-employed businesses operating in the 23-county Southwest Minnesota planning region. The largest number were located in the largest counties – Blue Earth, Nicollet, Le Sueur, Brown, and Lyon were the top five in Southwest Minnesota. Different counties saw different shifts in the number and types of nonemployer establishments over time. After rising 14.8 percent, Lac qui Parle County had the fastest increase in self-employment from 2006 to 2016 – ranking fifth out of the 87 counties in the state; followed by Blue Earth, Lyon, Nicollet, and Rock. Faribault County saw the fastest increase in the past year, rising 2.4 percent from 2015 to 2016. More details about self-employment trends in Southwest Minnesota can be found at this interactive data tool on DEED’s website.